The editing board of the Journal of Romanian- Japanese cultural interferences "HAIKU" is continuing to organize the annual competi-tion for haiku poems in fixed form, during the first trimester of 2011.
a number of 6 (six) haiku poems (5-7-5), up to 31 March 2011. 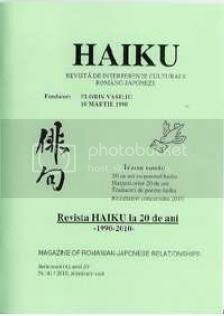 The results of the competition will be published in the HAIKU Journal nr. 45 - semester I/ 2011, and the prizes and diplomas will be sent to the winners by mail.